Dheeraj Sajwan belongs to a very backward area of Garhwal, Uttarakhand. He did his schooling from GGIC Mussoorie. He was a science student. After schooling he took admission in MPG College, Mussoorie and started his graduation but due to his family problems, he was not able to complete B Sc and left the college in final year. He was used to watch a local news channel of Mussoorie and he got interested in the field of media. 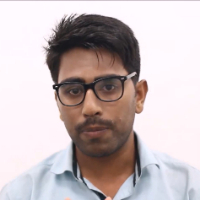 Then he worked for that Mussorie local news channel and there only he thought that he should choose media field as a profession and did Mass Communication course. After completing Mass Comm and learning so many things about media field, he worked for many media houses. In the year 2015, he started working with HNN 24*7 as a Reporter. Field reporting is the backbone of journalism. It is the production and distribution of reports on the interaction of events, facts, ideas, and people that are the "news of the day" and that impacts society to at least some degree. "I used to watch a local news channel of Mussoorie and got interested in the field of media. Then I worked for that Mussorie local news channel and there only I thought that I should choose media field as a profession and did Mass Communication. After completing Mass Comm and learning so many things about media field, I worked for many media houses. In the year 2015, I started working with HNN 24*7 as a Reporter."